Amit Ehrlich, Legal Counsel of Ehrlich & Fenster, a founding partner of the IP law firm Ehrlich, Neubauer and Meltzer and CEO of IPTrade, has been working with the Dennemeyer Group since the foundation of Ehrlich & Fenster in 2000. 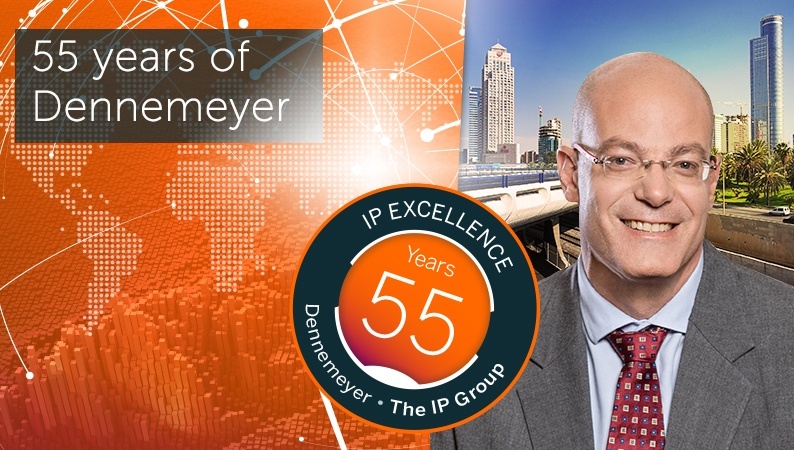 Israel’s leading IP law firm has not only become one of the most significant clients of IP law firm Dennemeyer & Associates but also used almost all of the services provided by Dennemeyer IP Solutions. More than just a business relationship. My best wishes to the Dennemeyer Group! From a client’s perspective, it is incredible how the group has developed since we started working together back in 2000. From a personal perspective, I want to add something which I cannot say about many of our business partners: We, and that includes the entire board of Ehrlich & Fenster, and the Dennemeyer management have become personal friends. Of course, we know each other’s companies, but we also know our children. Ehrlich & Fenster was established in 2000 through the acquisition of the law firm of the renowned Israeli patent attorney Benjamin Barish. He had already been working with the founder of the Dennemeyer Group, John J. Dennemeyer, for quite a long time back in the past century. So, it is fair to say that Ehrlich & Fenster kind of “inherited” Dennemeyer – or at least the cooperation with the Dennemeyer Group. Our cooperation became even closer when the current top management took over in 2008, Reinhold Nowak as CEO and Robert Fichter as head of the global IP law firm Dennemeyer & Associates. Our business grew, and soon Dennemeyer established as one of our primary agents for Europe. Today I can say that the Ehrlich group uses every service rendered by the Dennemeyer Group, except for the IP management software. We even developed services together as partners, such as the National Phase Entry Gateway portal in 2012. Robert and Reinhold helped us a lot, professionally as well as personally. For example, you could say that we followed them on their way East. When Dennemeyer’s office in Brasov, Romania, became so big that they had to move to a larger building, we took over their old premises. In this context, Dennemeyer also supported us with a lot of administrative issues. What makes our cooperation so unique is that everybody within Ehrlich & Fenster personally knows their counterparts at Dennemeyer, and we know that we can always call and ask for advice or support, if necessary. There are strong and reliable links on a personal level that create the best solutions and services for each client. Apart from that long standing relationship, I am convinced that this is what differentiates Dennemeyer in the market: it is an extraordinary blend between professionalism and flexibility, with client’s needs and fair price in mind. Let me give you an example: one of our clients suddenly approached us with a very special request. They were asking for a request for proposal for an “all inclusive” rate that was not a very common thing in this particular area. I knew that Dennemeyer would be flexible enough to accept the challenge and make exactly the kind of offer the client expected - even though it was a special request, and not an “out of the box” service. A second thought that comes to my mind: Dennemeyer is the “one stop shop” for the global management of IP. We cooperate with Dennemeyer in Europe, Japan and soon also in Australia and, as I said before, we use almost every service that Dennemeyer offers. I cannot think of any IP related assistance that Dennemeyer would not offer at all. What an incredible explosion, service wise, but also looking at your global reach! Every time I receive a Dennemeyer mailing or read your IP blog, I find another new office somewhere in the world. For the next 55 years! All the best wishes from Ehrlich & Fenster, and may you have many more clients such as us!